(NaturalNews) Digital meters, better known as 'smart meters', are being installed on homes throughout the world. These radiation-emitting, surveillance devices are watching every move you make; while, at the same time, bathing you with cancer-causing radiation. Without regard to human health, power companies are looking to capture the entire population with this new, highly-toxic technology. 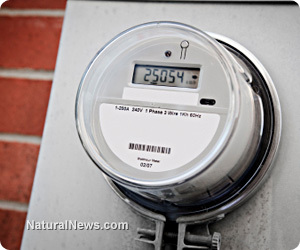 Smart meters are spying on you! Smart meters represent the greatest violation of personal privacy to date. As if the sickening amount of radiation wasn't enough - these devices record every activity performed in the privacy of your home and get transmitted (wirelessly) to corporate giants - like your local power company. On the next NaturalNews Talk Hour, you'll discover why this technology is the ultimate health risk and, more importantly, what you can do to avoid having these dangerous units attached to your home. Why does your local power company support a global agenda? The answer may be as simple as money. Power companies are under enormous pressure to build more power plants - throughout the world - as energy consumption is climbing. But, the costs are astronomical, when you consider real estate needs; zoning issues; copper wire costs and expensive man hours to install everything. Therefore, setting up a wireless grid can eliminate these concerns, cut costs and dramatically improve profit margins. But, as we all know, we're also living in a world with less and less privacy. As digital technology advances - so does the temptation of criminally-minded individuals to capture information and use it against the population. In truth, these digital meters wirelessly transmit your personal information without any guarantee of security. So, if you don't like this idea - find out what you can do. On the next NaturalNews Talk Hour, personal freedom crusader Jerry Day and Jonathan Landsman talk about how you can legally stop your power company from hurting you plus much more. Why should everyone be concerned with electromagnetic pollution? Everything in modern medicine and technology is making humans more vulnerable to electromagnetic pollution. Chemtrails, dental amalgams, vaccines and heavy metals in our food supply make us hypersensitive to electromagnetic frequency vibrations. These highly-toxic electrical disturbances cause oxidative stress, cell death and, eventually, chronic disease. So, you may be wondering, how is the heavy metal burden - within our body - directly related to the health problems associated with electromagnetic pollution? The answer is quite simple. The heavy metals in our body as like mini-antennas in the presence of electromagnetic-emitting cell phones, cell towers, wi-fi networks, cordless phones, and many other radiofrequency devices like, smart meters. This is why heavy metal detoxification is so important for optimal health. And, above all, don't let a smart meter get installed on your home. Join us for an empowering, informative program. Jerry Day is an Emmy-winning television producer and has produced a series of youtube videos on digital utility metering. Those videos have gone viral to over two million views. Jerry Day has been in the forefront of the digital metering opposition movement by offering legal documents - free to the public - to put the power company on notice about their legal violations, and by offering analog electric meters in special meter replacement kits. Those kits have been purchased by hundreds of utility customers who wish to remedy the unsafe and unlawful metering of their power companies. Apart from youtube videos, Jerry Day has done no advertising and his earnings from the meter kits go into personal phone support and guidance to people who call with questions about their meter issues. Protect your health and privacy! On the next NaturalNews Talk Hour, Jonathan Landsman and Jerry Day talk about the dangers of smart meters and how to avoid having these radiation-emitting, surveillance devices placed on your home. This program reveals how to stop the utility companies from harming your health.